Well, it didn't take long, but I think the kids need a larger layout, and something a bit better planned and constructed. I made a 189cm by 110cm base board for them that slides under the bed, but with it pulled out there's not a lot of room, and if they need to change some of the points or if a train derails they end up having to walk on the board to sort it out. This is ruining the grass mat, and they keep knocking things over. 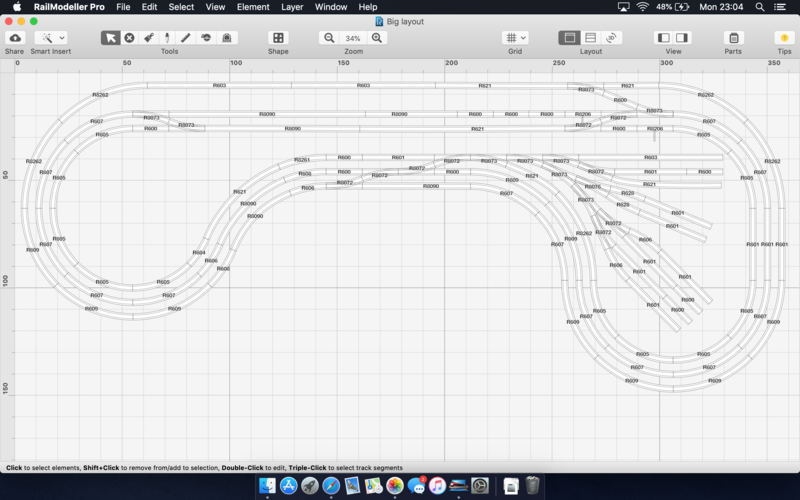 So I've decided that it'd be better if the layout ran on top of their chest of drawers etc and had a loop at each end with a narrower section in the middle where they should be able to reach across and do the points. It would also allow for a small shelf to be mounted under the board with the controller on it, and an office chair or 2 for them to sit in while using it. Space available is again very limited, its a small double room, with bunkbeds and enough storage for 2 kids. If the layout runs on top of the chest of drawers etc I should be able to make it around 12' long, with enough room to come out to around 5' at 1 end, around 3'9" the other end and around 2'4" in the middle. 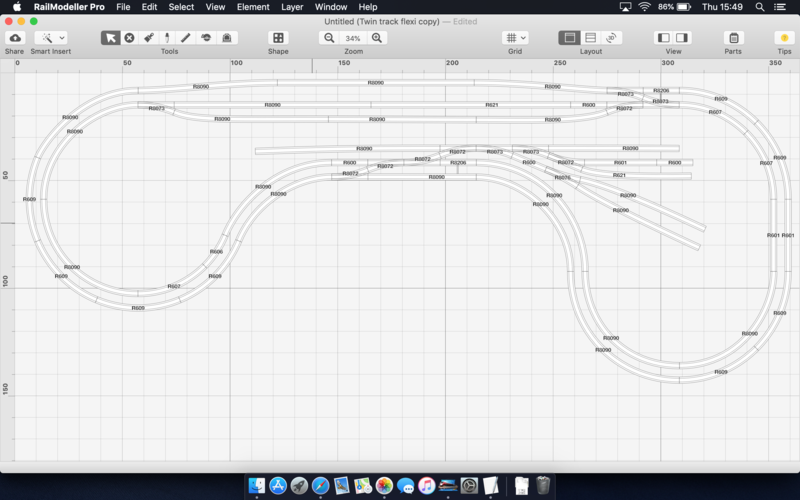 I've used RailModeller to plan a layout that should suit their needs. This first photo is how it'll be initially, just 2 tracks, with a section allowing them to change the direction of travel. The 2nd photo is how it'll be in the end, with a track for each of the children. The station will be along the straight section at the back, with a hill built around 1 of the corners as they're desperate for a tunnel. Still not enough room for the requested bridge, but I'm sure they won't be too upset. Just need to figure out how to go about making the baseboard and frame, and where the drawers etc will go. I'm guessing a batten all around the wall will be required, with some extra legs at the front where it's not supported by the drawers. I'm thinking that 12mm will probably be best, should be plenty strong enough, and should be easy enough to hammer the pins into it. However any suggestions with regards to this would be much appreciated. Just be aware that the top plan does have a reversing loop in it. The long lead into the sidings and the double cross over connected to it form the loop. Yes, thanks, that section would just be used so they could swap to the other end of the coaches, so they would just have to enter that section, stop, close the points at the end they entered, open the other end, and then set off again. TBH the only 1 likely to use that would be my eldest and he's 7 so should be able to cope with having to turn the dial the other way. Alternatively, if I can get a 3rd control I could possibly isolate the whole section of sidings, and have all that part controlled separately. Buelligan wrote: Yes, thanks, that section would just be used so they could swap to the other end of the coaches, so they would just have to enter that section, stop, close the points at the end they entered, open the other end, and then set off again. TBH the only 1 likely to use that would be my eldest and he's 7 so should be able to cope with having to turn the dial the other way. Reversing loops are best avoided unless you are an experienced modeller, you need to ensure that you have isolating rail joiners on both rails behind each point and a DPDT switch feeding the track in between. Just relying on the points to isolate will not work. Thanks, I think I replied on the baseboard thread, but I'll put it here as well. 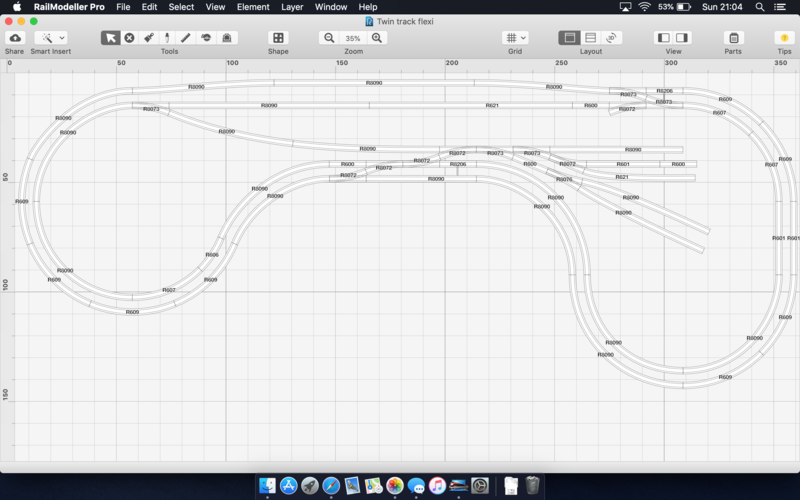 That loop was initially just because in the not too distant future I'd add another track inside, for small engines. 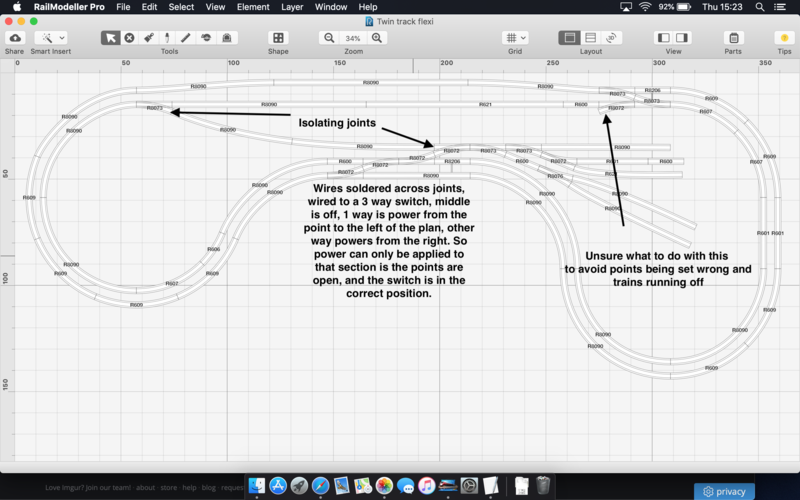 For ease later on, I wanted to lay those points ready for it, so all I have to do is connect the new track, and not have to take up other sections to put in the relevant points. I wanted to reduce the risk of the points being knocked, a train coming around and flying off at the points, onto the board. I'll attach a plan below of how I think it can be wired to keep it. If really necessary to remove that section, the 2nd plan shows another way I could avoid accidents at the points. The 3rd plan is just a repeat of the last image in the original post, which is the final plan, with the 3rd track for my youngest. Mainly 1st radius so only be able to run small goods type of trains.